I had a fight between my personalities about if I should watch it. Then someone offered the +1 seat and I jumped at it. 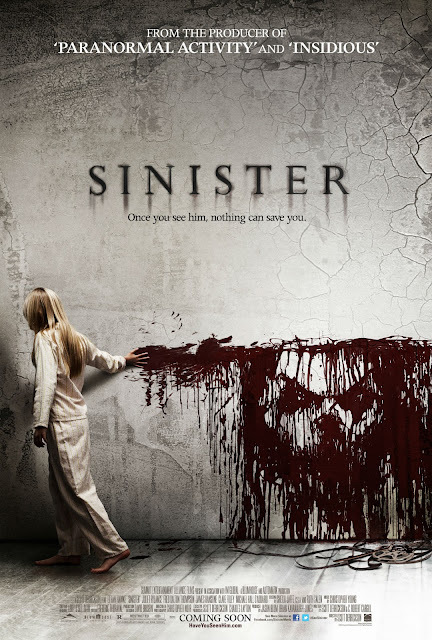 Sinister is a well named horror/ mystery movie that evolves around a real crime writer and the evidence he found while writing his new book. Ellison moved into a house with his family to work on his new book which involves a missing child and the rest of her family who were hung dead on a tree in their backyard. Upon moving in, he finds a box with videos filmed with super8 films, with labels that sound like how people would casually label a family day. He plays them, and learns more than he expected. Like 99% of horror/ thrillers I've watched, sound effect played a huge role. The visual effects were somewhat scary, but it won't work as well without the sudden loud thuds and screeches. If you're a horror/ thriller movie fanatic, this is something for you that is different from the past few that I've watched. It's not all horror and suspense though, it has a strong touch of gore too. I was scared even for the parts when people were just talking. The horror sank in and got cozy. Yes the stupid scream made me jump in my seat. --______--lll Even though I was expecting something to happen at that moment. Manly man me was never disturbed or sound-beaten into submission.